During my last shopping trip to an antique mall, I found these over sized beads with a cross. I have been wanting some for a very long time now, but they are usually too expensive. These were the cheapest I've ever seen them. So..........they came home with me! I decided to hang them on my horse statue on the mantel. They sold them in two different colors. One was a dark brown, and the other was a soft ivory. I chose the latter. I'm enjoying them here for the moment. I like that they can be used in any room in the house and they can be draped on something or lie flat on a table. So, I guess waiting paid off since now I have this without the big price tag. I love them! Yes, I have gotten some great deals by being patient! I've got many horse statues, I have to figure out where to put them. Yours looks really nice with these wooden beads. Pretty! They'd look nice draped over the corner of a mirror, too. I love those, Kelly. What a find! Hi Kelly! Oh, your patience paid off - this looks wonderful. Love your horse and the beads just set it all off. You always make wonderful pretty! 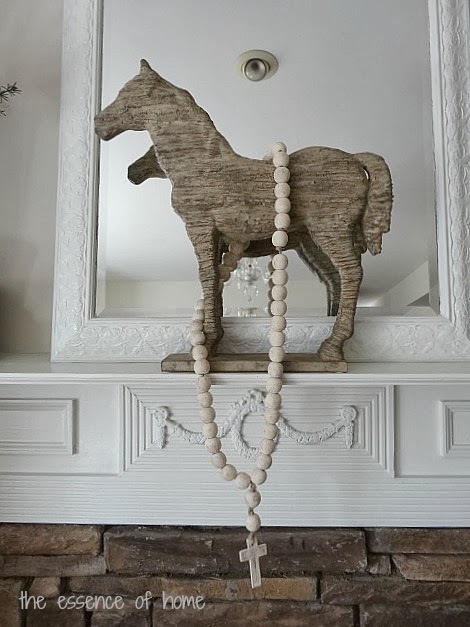 Love the old beads...and I love the horse too!! They look great draped over the horse. I have a wood horse, but he is really dark in color and I've been going back and forth on rather I should paint it all white. Absolutely!!! I always wait for things to be on sale - or show up at the thrift store!! Yep, I may still get some of those when I go back. So many great ways to display them. Great find....love them on your horse. I have a set I made because I could never find them for reasonable. Your patience paid off and you got a beautiful set of beads with the cross. 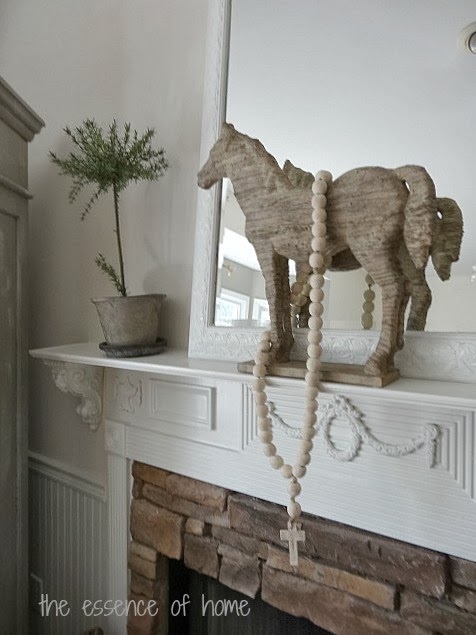 It looks awesome on the horse and mantel. That's the most fun part when you get something you wanted and for the best deal just because you were willing to wait. The beads look good there. I have a santos doll and I have a feeling some beads like that would look great draped around her shoulders. That was a great find, Kelly! I think you picked the perfect spot too. 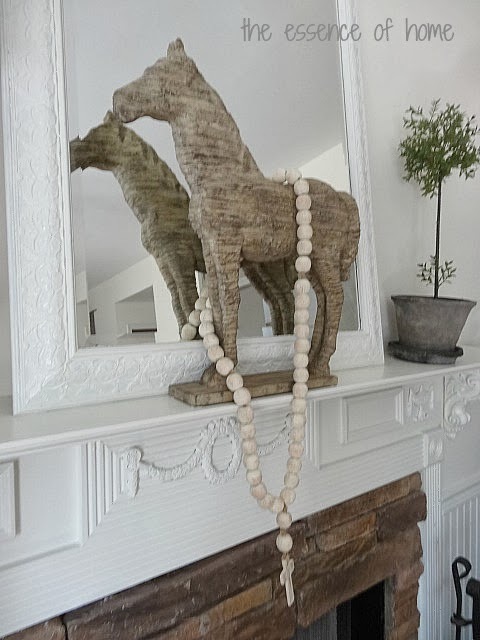 The wooden beads look perfect on the horse statue. Kelly, I have similar one in dark brown (wish they had the ivory ones) and love them. The beads look wonderful draped on the horse. The beads look great and I really love your horse statue.....so much!!! Love that horse statue!! Great find on the beads!! Very nice find, Kelly, especially at the right price! 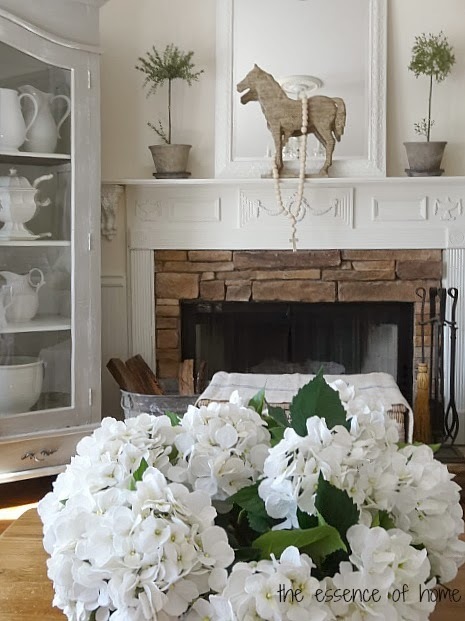 Your mantel always looks so good with each of your change ups. Kelly, They are so pretty...love the ivory color and they're such a nice size for display. Great find! Yes, it's happened once to me with carpeting that I wanted. Glad you finally got something so special, that you always wanted! So pretty! They look beautiful hanging on the horse. Your fireplace and living room is so gorgeous! Oh my gosh what a find! I would love to find one myself but I may just end up purchasing one. Patience really pays off sometimes. I love your horse and the large beads with cross. 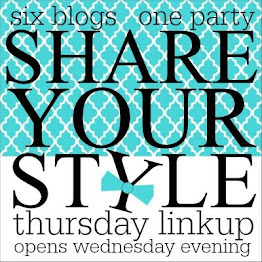 I love it when I 'm not looking for anything in particular and find something fabulous without the huge price tag.